Throughout this week, BBC Radio 4’s afternoon flagship news and current affairs programme PM has been running a series of features on the existing state of the jobs market in the UK. Three pieces of information have stood out for me so far. Firstly, we have a massive shortage of engineers in this country; secondly, we don’t have enough quality apprentices to meet the demand; and thirdly, careers advice in schools is generally rubbish. These three points are interconnected and can be traced back to one key theme – our education system still doesn’t give our children and young people the necessary skills and direction to meet many of the needs that our employers are crying out for. When the powers that be decided to neglect apprenticeships and vocational training in favour of encouraging all and sundry to go to university, they made a glaring error. Schools seeking to twist the exam league tables to their advantage have further compounded the problem by pushing their students to take the ‘softer’ subjects and avoid those more challenging ones like physics and modern languages that actually open up a wealth of future opportunities. Exams become the focus and young people are encouraged to pursue their dreams, but with little by way of guidance to assess the validity or scrutinise the likelihood of those dreams being fulfilled, and often without any realisation at all of a bigger picture. The result? We get swathes of students wanting to become criminologists or photographers, where job prospects are limited, but a dearth aspiring to some of the more regular professions, such that we are seeing the closure of university science departments. What makes the situation worse is that ‘life skills’ such as independent thinking and creativity have been pushed out of the school curriculum. How to cope in an adult world where you haven’t got others constantly around to give you the answer or organise your life for you is rarely on the agenda. Having spent part of my life working for a bank on a university campus, I’ve dealt with hundreds, if not thousands of undergraduates who may be academically clever, but had little idea of how to manage a bank account and their finances effectively. It’s not entirely their fault; many of them will have had next to no useful advice on budgeting, interest, charges or making sure they avoid running out of money. Our education system is certainly not broken, but in spite of endless government initiatives, it couldn’t honestly be described as fixed either. Anyone with a modicum of common sense will understand that being able to look after your money well is of far more value throughout life than being able to describe coastal erosion or analyse Jane Austen. It’s time for a revolution in thinking, and this week the Church of England has announced one of its own for its schools. The public has great confidence in what Church of England schools provide. Parents know what they want for their children and they recognize, in the rounded, broad education that our schools provide, something special and attractive. So yesterday part of that solution was revealed. A network of savings clubs in primary schools, which could give pupils as young as four years old practical experience of money management, is being proposed as part of a drive to raise the level of children’s financial awareness. These savings clubs administered by credit unions in the schools will encourage children to save small, regular amounts of money. They will also be given opportunities to take part in the running of the savings clubs, as junior cashiers or bank managers, with practical learning reinforced by classroom teaching materials. Parents and school staff would be allowed to join the credit union as part of the “whole-community” approach of the programme, with parents given the chance to set up dedicated accounts to save for school or family-related expenses such as uniforms and school trips. A report by the The Children’s Society, has been simultaneously launched, arguing that children need financial education from an early age as they face increasingly complex financial futures. It finds that many financial habits are formed by the age of seven. Once again, as was the case when Justin Welby made a momentous assault on payday lenders, the tactic is not to stand around moaning about the failings of the system, but to get stuck in practically and offer a better alternative. 200 years ago there were no alternatives in education. The state was nowhere to be seen and it was largely down to churches to provide the bulk of the national education system we see today. Now, in an area where governments and educationalists have let successive generations down, the church is leading the way. 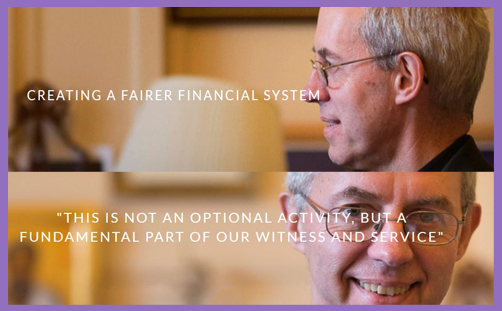 Along with the schools announcement and The Children’s Society report, the Archbishop of Canterbury’s Task Group on Responsible Credit and Savings has also launched #ToYourCredit, which describes itself as Justin Welby’s initiative to create a fairer financial system focused on serving the whole community, where everyone has access to responsible credit and savings and other essential financial services. This initiative, with its accompanying website, will hold all of the Church of England’s community financial initiatives and resources under one umbrella. With ++Justin personally appointing former CEO of the Financial Services Authority Sir Hector Sants to the Chair of the Task Force, we should be in no doubt that they mean real and culture-changing business. But why, if the Church has the job of being the bride of Christ and preaching the good news of the Gospel of Jesus, is ++Justin so obsessed with finance and money? We know he was in big business before he became a vicar, but shouldn’t he be focused on dealing with crumbling church attendances and various other ongoing difficulties that the CofE finds itself in? Is this just an unbiblical and distracting pet project? The thing is, it’s impossible to read the Bible for too long without finding mention of either money or debt. Money can be used as an instrument of power, which, when put to good use, can achieve great things. More often than not, though, money ends up holding power over us; we become slaves to the desire for more or trapped under the burden of debt. It takes hold and rules over us, rather than the other way round. The love of money, as the Apostle Paul says, is a root of all kinds of evil. But poverty can be the source of all forms of evil, too. That’s why Christians are repeatedly called to love and serve the poor. Without practical ways of relieving the financial suffering of others in need, how can they be offered the promise of eternal life with compassion and sincerity? The Spirit of the Lord is on me, because he has anointed me to proclaim good news to the poor. He has sent me to proclaim freedom for the prisoners and recovery of sight for the blind. To set the oppressed free, to proclaim the year of Jubilee. This is definitely about spiritual freedom, but also an earthly one too – the Year of Jubilee was an Old Testament tradition of wiping clean the debts and returning borrowed property. This is about redemption and restoration, both spiritually and physically: God cares about every aspect of our lives. If churches around the country are willing to do so much for those financially in need through food-banks and debt advice and support, then surely it makes sense, wherever possible, to educate people so that they are able to understand how to avoid getting into monetary difficulties in the first place. This is as much of a Godly gift as a bag of food might be to satisfy a hunger that can quickly return. Not only does this apply to individuals, but to the nation, too. If we had been more averse to spending beyond our means, and our politicians were willing to respond to that, our national debt would not have been allowed to get out of hand during the years of prosperity. Through better financial stewardship we would be paying out less in interest on our debts, which would mean less hardship, especially for those on the lowest incomes, and more benefits and security for all of us. Justin Welby has a big vision to change the financial landscape and climate in this country. It means a return to greater morality in banking and the financial sector, but also raising generations that are able to knowledgeably take control of the money they have, where saving and borrowing are able to all in a fair and just way, and those who wish to take advantage and exploit the vulnerable and insecure are never allowed to go near them. This is all comes down to placing God’s values at the heart of our society in order that we can all benefit. For centuries it was the Church that was the driving force behind social change and improving the lives of the poorest, before the state took on the job. It looks as though the wheel has almost turned full circle. Once again it is our churches and their schools that are beginning to provide hope for both our spiritual and physical needs. This is the Church of Jesus Christ as it should be.